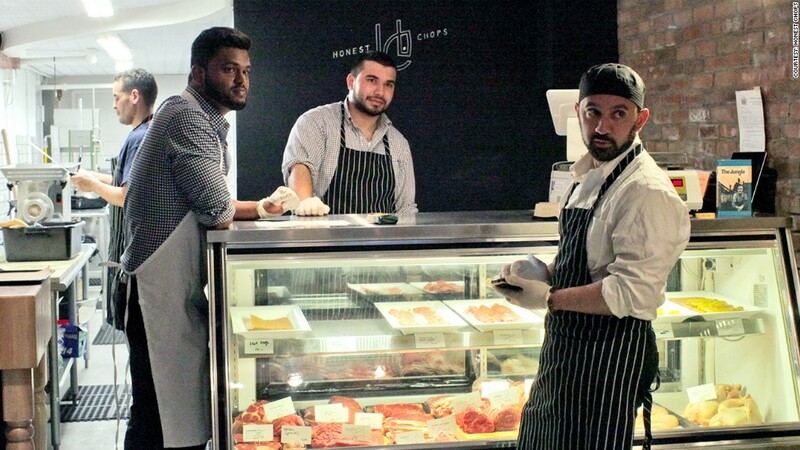 Russell Khan, Sulman Afridi, and Khalid Latif (left to right) at New York City's Honest Chops, the country's first halal whole animal butchery. Thick T-bone steaks and richly marbled oxtails decorate the display case at Honest Chops, a new whole animal halal butchery in downtown Manhattan. Not only is the shop committed to selling humanely raised meat, it's all slaughtered in the Islamic tradition, which involves a prayer and quick death using a sharp knife. Khalid Latif, who founded the butchery in March, spoke to Muslim students and working professionals in his community who wanted a higher quality of meat than their neighborhood markets offered. Initially, he and his partners Anas Hassan and Bassam Tariq were just interested in opening a halal butchery. But after learning about the unnatural feed that commercial cattle and chickens are raised on, they opted to source their meat from small producers in upstate New York, Maryland and Massachusetts. "When there's not a certain kind of purity to the food that we're consuming, that becomes problematic from the spiritual standpoint," said Latif, who has rigorous standards for the meat he sources. Everything at the shop, from its seasoned hamburger patties to whole chickens, is humanely raised on a vegetarian diet, free of hormones and GMOs. They call it their "Honest-to God" guarantee. While the concept appeals to the pious, the shop's locally grown focus has also attracted secular people, who make up 60% of its customers. "We were understanding of the demographics," said Latif, whose storefront neighbors several college campuses and a string of retail boutiques. "We tell our community members that they shouldn't look at their faith solely as something that brings benefit to them. Really, it's ensuring good quality meat to people who need meat." Unlike conventional butcheries that source mainly boxed cuts, Honest Chops' head butcher Rex Workman carves chuck roasts, sirloins and flank steaks from the whole cow. He grinds the odd bits into sausages and seasoned patties. "Committing to use whole animal poses challenges, but these can also be opportunities," said Workman. His unique sausages, with names like The Patham and Ninth Degree, generate a profit on what would otherwise be wasted. Reeducating customers about the cost of their product has been a challenge. Hand-slaughtered chickens run $3.50 per pound, nearly double that of their industrially grown counterparts, and beef sells for about 30% more. "People don't understand the entire process," said Zaid Kurdieh, the owner of Norwich Meadows Meats, one of the shop's suppliers. "We sell food that is raised correctly, and that costs a lot of money." Still, their prices are competitive with other artisanal butcheries. The business currently breaks about even, with slower periods during the week and steady foot traffic over the weekend, when the shop regularly sells an entire cow's worth of meat (which is about a third of their inventory). The business opened with $200,000 in capital, which came from individual investors in the Muslim community. Khalid hopes to increase their customer base and make the business profitable by offering delivery to Manhattan and the outer boroughs. He said he has 700 potential customers interested in the service. With increased sales though, he is concerned about sourcing from his suppliers' limited stock. "Many hadn't anticipated raising that much livestock this year," said Latif. "We're essentially in a place where if someone has a cow or a chicken, we ask to take it from them." Over the next two years, Latif and his partners plan to add a slaughter facility to their operation to speed up production. They are also exploring sourcing from Australia and New Zealand, where farming practices are typically humane and comply with Islamic law. Over time, they hope to donate a percentage of the revenue back to the Islamic Center to fund social services for the Muslim community. "It's really about bringing benefit to the society around us," said Latif. "We want to ensure from start to finish everything is transparent and you can really trust where the meat is coming from."